At what point did birthdays cease to be fun and exciting? A couple of weeks ago I celebrated my birthday and with that being another year older. Unfortunately, it was the second day of school for me, I was sick, and the night before my husband jokingly reminded me that I am no longer in my early 30s anymore and quickly heading for "old age". In contrast, when I was a kid, time crawled by slowly and birthdays were fun events. Back then, my mom made me a cheesecake and I was excited to be a year closer to being mature and independent, which are enticing adjectives when you're just a kid. While my birthday might have started out on a sour note, I realized that there is so much to be happy about and to celebrate with each passing year. Plus, once I left work, the day magically seemed to get a whole lot better. (It's funny how that works!) My husband took me to one of my favorite restaurants and made me brownies when we got home. While brownies from a box might not be a cheesecake from scratch, it is the thought (and the ability of the chef, or lack thereof) that counts! In terms of what I wore on my birthday, I decided to opt for something a little sparkly because it was a celebration after all. In this spirit, I decided to go for this sequined top that I picked up on what I would call "super clearance", plus my birthday discount, from Anthropologie last month. It just happened to be the perfect match to my "Garden Leaves" skirt from Kate Spade, which has gotten a lot of wear this summer. So be it a great sequined top picked up for an extraordinary price or brownies cooked with love by a husband who has trouble making frozen pizza, there is always something to celebrate and be thankful for, which is more important than dwelling on being another year older! Perhaps with age comes wisdom after all. I love this outfit and all the pattern mixing. Brownies is a requirement for all my Biryhdays, as I can't get enough of them. Happy Birthday! Thank you! Brownies are so amazing be it from scratch or a box. They are just perfect for birthdays or any occasion! That top is so cute! 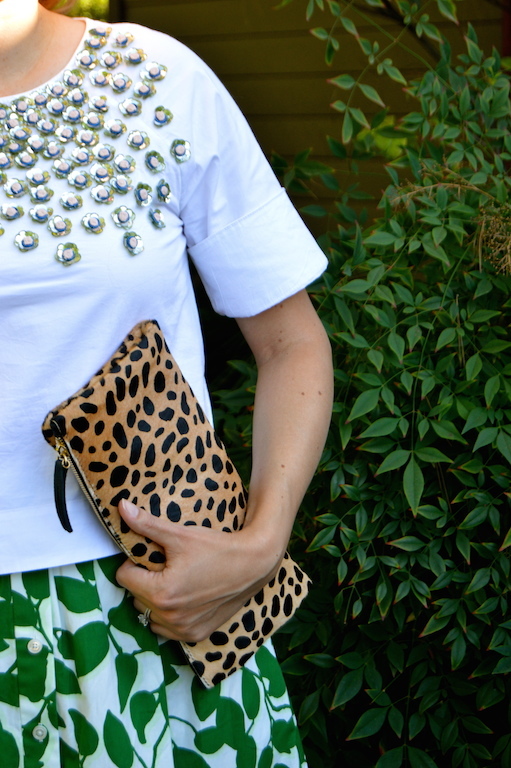 I also love that leopard clutch. Thanks! I didn't love the top until I saw it in person, but I think it will go with so many things in my wardrobe! The clutch is one of my most used accessories! Sounds like it turned out to be the perfect birthday! Your sparkly top is adorable and is perfect with that skirt! Thank you Jill! Yes, indeed it was the perfect birthday except for that pesky work thing! Thank you! I love these sandals as the silver goes with almost everything in my wardrobe. Happy Birthday Beautiful. No way you are not in your early 30s. Love the top, skirt and cluch. You look lovely! Happy Birthday! How much do i love your skirt! It's stunning. Well done for getting your sequins top on sale. Your husband sounds so lovely. I recently had my 40th birthday, so you're still very young to me. Thank you for the birthday wishes and happy belated birthday to you too! Yes, my husband is great and I am definitely very lucky! Chic and fabulous! Your top is too cute and the prints in the skirt is very unique. Love your style. Great attitude for another year older. Love your sparkly top - perfect for celebration! Happy belated birthday! I know... I am not even in my mid-thirties anymore, but the thirties have still been great! I love boxed brownies :) You top is so pretty and it goes great with that skirt! Belated happy birthday! Well done that man for baking you brownies! He gets triple brownie points for that! 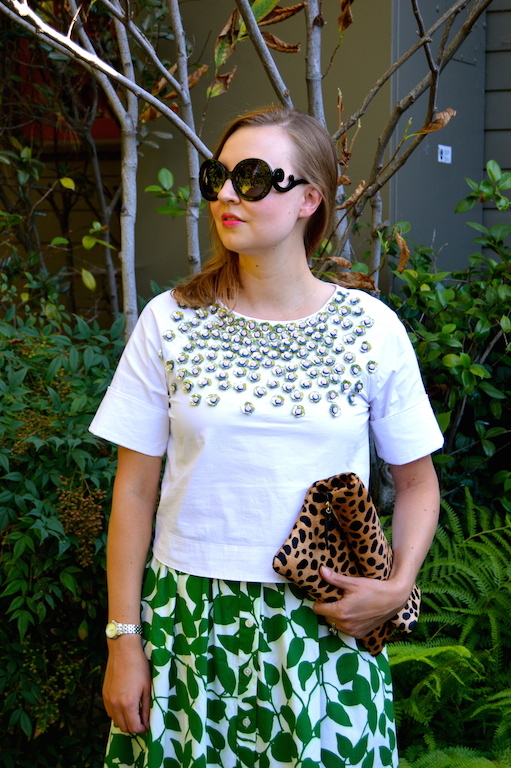 Lovely birthday outfit and great choice to pair with a leopard bag.